THERE’S NOTHING QUITE LIKE THE ENDLESS POSSIBILITIES THAT THE BLANK CANVAS OF A FRESH SKETCHBOOK REPRESENTS. 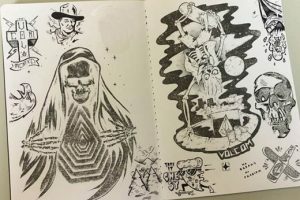 We gathered some of the artists from the Volcom Art Loft to share how sketching has played a significant part in their lives and still continues to to this day. Do you have any memories of spending time in class sketching instead of paying attention? 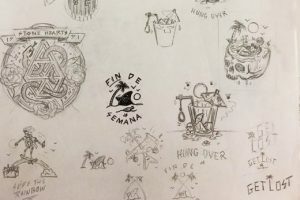 KIRK “DEADBIRD” MUESSE: As far back as I can recall, I’ve been told on many occasions that my doodling was disrespectful and would get me nowhere. My teachers were half right. PATRICK CARRIE: Definitely in 4th grade when I started drawing band logos and alternate album covers all over every inch of my binders. JAMIE BROWNE: It’s harder for me to remember a time I was paying attention in class instead of sketching in my books. AARON MASON: I would ditch computer class, go to Dietrich’s Coffee, and sketch what I called “Skate Ramps from Hell”. The irony is now I work behind a computer all day. How do sketchbooks fit into your work today considering how much time is spent on computers now? PATRICK: It’s no secret I’m a much more of an analog-lover than a digital one. I’m always surrounded by my sketchbook and like, 30 post-it notes to keep track of ideas, sketches, artwork, notes and one-liners. Maybe it’s 2 minutes with pen and paper for every 8 on a computer, give or take. AARON: I have to make time, because if I don’t I will have a man-tantrum. Having an art job makes it easy though. A lot of the graphics used for [Volcom] t-shirts start in my books. 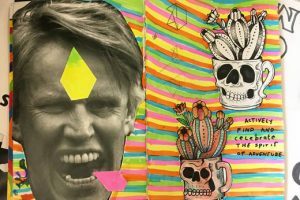 DEADBIRD: I just vomit into sketchbooks. Any idea, I try and get down. All ideas start there on their way to paintings or pixels. 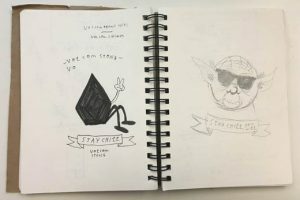 JAMIE: Although computers are a crucial tool in the final stages of the design process and getting graphics ready to print I can’t stress enough the importance of sketchbooks in my daily life. They are where my ideas start out, scribbled at first then fleshed out, tweaked, refined or scrapped completely. Sketch books are where many of my final artworks still live and they clutter my desk at work and home. I also carry a small moleskin with me most of the time so I can sketch stuff down at the bar over a few coldies! Are there any particular pens or pencils that are your favorites to sketching with? AARON: Microns, X-acto blades and tears. Because I cry a lot. JAMIE: I mostly work with pencils and Artline felt tip pens. DEADBIRD: I like Faber Castell pens, Artline pens, Poscas, Windsor Newton ink wells and good old fashioned elbow grease. PATRICK: The pilot precise V5 is my go-to pen. I sometimes dabble with some Micron pens if I need more control over my line work, but the V5 is pretty clutch for most of my needs. That and fresh Sharpies®.